This week families across the country will be celebrating Thanksgiving—sharing food and telling stories. Here is my story about our food and culture that would be destroyed if Shell Oil gets the permit to drill for oil in our homeland—the Beaufort and Chukchi Seas. Since 1986 I lived in Nuiqsut, an Inupiat community on the Beaufort Sea coast of Arctic Alaska. In 1991 I graduated from the University of Washington Medex Northwest Physician Assistant program and was employed as a health aide in Nuiqsut for 14 years. Nearly 8 years ago I helped to found REDOIL (Resisting Environmental Destruction on Indigenous Lands) to represent my interests. I have raised my family in Nuiqsut. I have one daughter, four sons, two granddaughters, and four grandsons. I live a very traditional lifestyle—hunting, fishing, whaling, gathering, and teaching our family and community members the traditional and cultural activities as my elders taught me. We hunt and eat various birds, including ptarmigan, ducks and geese; fish, including char, salmon, whitefish, dolly varden, grayling, pike, trout, and cisco; land mammals, including caribou, moose and muskox; and marine mammals, including bearded seals, walrus, beluga and bowhead whales. We harvest berries, plants roots and herbs. We work together in harvesting plants and animals. We have extensive sharing traditions that unite our families and communities. Other communities share their harvest with my family and we share our harvest with others. These sharing patterns have given us much of the variety of foods that we eat. We also share our harvest with those in need. My mother taught me the land hunting skills that she learned from her parents and family. Other family members taught me how to hunt whales and other marine mammals. I have family ties that bind me to Nuiqsut and other communities in the Arctic, and exposure to hunting and gathering is an important part of these ties. Inupiat communities across the Arctic coast of Alaska primarily depend on Bowhead whales for subsistence food and our culture is tied intimately with the whales and the sea. Nuiqsut whalers hunt for bowhead whales in the Beaufort Sea during the fall. We await the migration of the whales from Camden Bay for this hunt. The crews go to Cross Island in August. My sons help the crews with their preparation. My ex–husband has gone whaling from Cross Island with his uncle a few times. Community prayer after a Bowhead whale hunt, Beaufort Sea coast, Kaktovik, Alaska. Photo by Subhankar Banerjee, 2001. There is a feast in the village after a successful whale hunt. Everyone is invited to the captain’s home to eat whale meat and other food, tea and coffee. I have participated in several of these feasts in Nuiqsut. These feasts are a time of celebration, when stories are told about the hunt. We have a unique sharing system to divide the harvested whale among the crew striking the whale and the crews helping to land and butcher the whale. The whalers also set aside a portion of the whale meat to share with those in need. Part of the catch is saved for feasting. We share the feast three times during a year, at the blanket toss—a traditional celebration during the summer, Thanksgiving and Christmas. 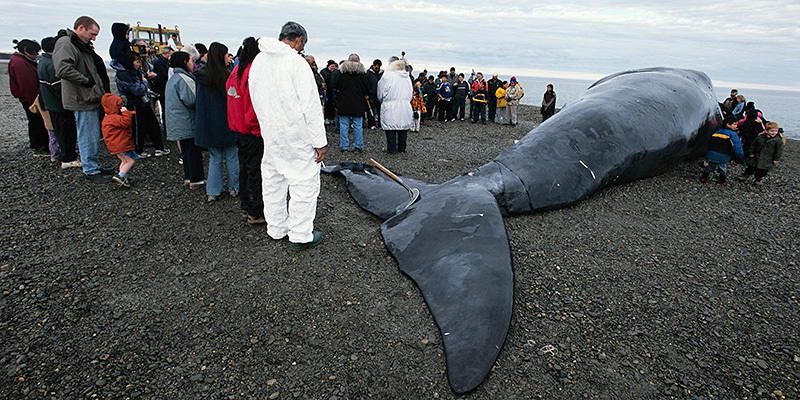 Sharing of the whale binds our communities. Whale meat feeds families throughout the long, dark winter, and provides nourishment, warmth and fuel for our daily activities during the Arctic winter. The foods we eat are important to our lives and health. We have activities associated with our harvesting throughout the year, such as skin sewing, sinew preparation, and craft making. The teaching of the activities and stories continues throughout the year with each generation sharing family hunting stories. Shell’s proposals to drill for oil and gas in the Chukchi and Beaufort Sea are detrimental to the traditional and cultural activities of our family and village. We depend on traditional foods that migrate through both Beaufort and Chukchi Seas. Any harm from Shell’s activities to our resources, including bowhead whales, seals, fish and caribou, threatens our food and our health. I am concerned that Shell’s exploration drilling, icebreaking, aircraft and helicopter flights, and other noisy activities in the Beaufort and Chukchi Seas will keep whales from their feeding areas or otherwise harm them. Any changes in the whale populations could affect our hunting. We educate our families that a whale hunt must be respectful and quiet. If the noise from Shell’s drilling and icebreaking causes whales to be farther offshore, I am concerned that this would place more wear on our equipment and put the whalers at greater risk. We have been taught not to put things in the water that may cause the whales to turn away from the hunting grounds. I fear that water discharges from drillships or the presence of drilling muds in the water where Shell conducts its activities could cause whales to avoid our hunting grounds. If the whale hunts are less successful, I fear that the community will suffer, as it has in the past during times of shortage. To give an example, in the early 1990s there was seismic activities and exploration drilling in Camden Bay that severely affected our whaling. The following winter, I heard of an unusually high rate of domestic violence in Nuiqsut and increases in suicide attempts and in suicides. I heard of and witnessed increases in drug and alcohol use as well. As a community health aid, I listened to people’s stories of how difficult it was to hunt without success. That winter was the worst I spent as a community health aide and the experience prompted me to speak out at meetings about oil development. We also depend on caribou for our subsistence food. I am concerned that helicopters and aircraft associated with Shell’s offshore drilling will affect caribou along the coast, and make the caribou avoid hunting areas, including traditional migratory routes and areas used for insect relief. Due to ongoing oil development on land caribous are already affected. We have a hunting cabin 8 miles from Nuiqsut. This cabin is across the river from the Alpine oilfield, and the activity levels around the cabin are so high that we travel up fish creek and other tributaries, away from the cabin, in order to hunt geese and caribou. I feel that the overflights have caused the caribou to avoid the area near our hunting cabin. My second youngest son was brought to the same area where his dad hunted his first caribou. My son shot a caribou there, but the wounded animal fled from a helicopter that was flying overhead, and moved into a water filled gravel pit, created for development of the Alpine oilfield, and drowned where we could not get to it. The loss of that caribou eliminated my son’s desire to attempt to hunt for the rest of the summer. I embrace the traditional and cultural activities that I learned from my elders and extended family members. Sharing and passing these traditions onto my children, grandchildren and families is very important to me. I fear that industrial oil and gas activities, including those put forward in Shell’s drilling plans, are changing our natural environment and thereby affecting my ability to live, share, and pass on our traditional way of life. Increased contact with unnatural activities causes a cascade of reactions. Taking the next generation hunting and fishing in areas that now feature signs and sounds of industrial activity—gravel placement, flight activity, personnel activity—is not the same. I have seen first hand how the Alpine oilfield affected our cultural camp at Nigliq and on the Colville River. There is a growing need to work in cultural camps that teach the next generation our hunting traditions. But teaching the young harvesters our traditions is getting harder because of oil and gas development that drives animals away from our camp. For example, the caribou herds are kept miles away by traffic, including freighter flights, helicopters, and airboats. When industrial activities that conflict with traditional and cultural activities are permitted to dominate our landscape, traditional usage of the areas that has persisted for generations loses out to expanding oil and gas infrastructure. The disconnect between our concerns and continual government permitting of oil and gas activities in our region is stark. Generations of our people have discussed and put together comments, mitigation measures, restrictions, and prevention attempts. Yet the government has not prevented the loss of traditional and cultural activities, impacts that the Council on Environmental Quality for the Bush administration told us were illegal. State and Federal Governments push the permitting process without looking at the losses created for us. We pushed for deferral and permanent restrictions of industrial activities during our whaling at Cross Island and we were kept out of meetings that changed these discussions. That also was illegal, yet the Obama administration has only allowed industrial activities to continue. National Marine Fisheries Service has stated that oil and gas activities should be postponed until baseline data could be obtained. Yet no new information exists to guide decisions. We fought for restrictions that were not honored. Words on papers create real loss to our stomachs and the rest of the process of sharing, teaching, celebrating, and learning. Hotdogs offered by industry in their meetings cannot replace the loss of our traditional and cultural foods and activities. When Will The Government Honor Our Concerns? Earlier this month there were federal government hearings in several Inupiat communities including Barrow, Kotzebue, Point Hope, Point Lay and Wainwright to hear our concerns about Shell’s Arctic drilling. I attended the hearing in Barrow, where I’ve been living since May of this year. We had about 60 people attend the Barrow hearing and overwhelmingly the statements were in opposition to Shell’s drilling plan. The hearing showed the continued concerns of the lack of ability to respond to a spill, lack of taking the concerns of the people into meaningful consultation, the lack of willingness to protect our traditional and cultural activities, and the continued stress and strain this is causing to our people. The risks of the process stay with us and the benefits are taken elsewhere. None of it is worth the risk to harvesting, sharing, celebrating, consuming, teaching, constructing crafts, preparing foods, planning, feasting, dancing, and singing. Oil companies have a long tradition of making promises and then breaking them by cutting costs to increase profits. Recently I read about a detailed study reported in The New York Times that concluded, “Arctic is not ready for such deep–sea drilling operations.” This is very worrisome for me. But I don’t need to know this from The New York Times—I live here in the Arctic and I know how dangerous it would be to drill for oil in the frozen Arctic Seas. We want to be Inupiat into the future not just residents in an industrialized area destroyed by Shell’s offshore oil drilling. Our animals, land and seas in the Arctic are already severely stressed by climate change. We don’t want Shell’s dangerous offshore drilling to add to our difficulties. I urge President Obama to hear our concerns and deny Shell the permit to drill for oil in the Beaufort and Chukchi Seas. Rosemary Ahtuangaruak is an Inupiaq activist. She is a graduate of the University of Washington Medex Northwest Physician Assistant Program. She has fought tirelessly for the health and protection of her people and of the Arctic’s unparalleled wilderness that has sustained her culture for thousands of years. Rosemary is a former mayor of Nuiqsut and currently serves on the board of the Inupiat Community of the Arctic Slope, the regional tribal government for the North Slope, and is an executive council member of the Alaska Inter–Tribal Council. She received the 2009 Voice of the Wild Award from the Alaska Wilderness League. She is a founding board member of REDOIL (Resisting Environmental Destruction on Indigenous Lands).